Cut each bagel into 8 pieces. Set aside. Pour sugar, cinnamon & pumpkin pie spice (optional) into a shallow baking dish and mix together. Set aside. To test your oil temperature, place one bagel bite in the oil. If it browns too quickly, lower your temperature. If it doesn’t bubble right away, increase your temperature. In batches, fry the bites for about 1 minute on each side. You’ll need to adjust based on the temperature of the oil. Once beautifully browned, remove from the oil with a slotted spoon onto a pile of 3 or 4 paper towels and lightly blot. 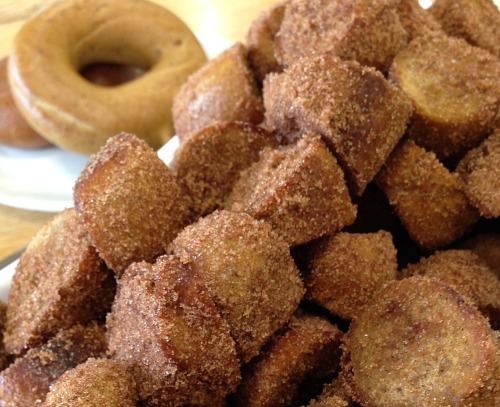 Quickly place in the cinnamon sugar mixture and toss to coat. Transfer to a cooling rack and allow to sit for 7 to 10 minutes. When ready, you can eat as is or serve with a scoop of vanilla ice cream. Note: Best to eat these within 4 hours of making them. * Pumpkin bagels available only for a limited time.